Bolton manager Dougie Freedman has said hard work on the training ground is being translated into resolute performances in the Championship. Freedman's Wanderers have kept clean sheets in each of their last two matches - the first time the club have achieved the feat in almost two years. 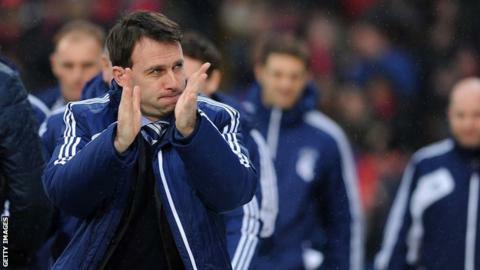 He told BBC Radio Manchester: "We work very hard at it and full credit must go to the lads for the work they've done. "I see signs that we're getting to be a team working for a cause." Bolton have prevented and from scoring in their last two outings. The last time Wanderers kept two clean sheets in a row was in FA Cup victories at Wigan and Fulham in February 2011. The 0-0 draw at Selhurst Park on Saturday left Bolton 16th in the table. Meanwhile, Freedman is keen to bolster his defensive options further by signing West Bromwich Albion centre-back Craig Dawson on loan. The 22-year-old has not featured for the Baggies in the Premier League this season. "Craig is someone I admire," said the Scot. "Craig is a West Brom player. We're continuing to speak to West Brom, and if they decide to let him out on loan, I will be putting my hat in the ring."